Part 1: Introduction to the AmazonSwiftStarter demo app and a pattern for backend abstraction. As explained in my previous post I am looking for a replacement of the Parse-backend of an app that I am developing. I decided to explore Amazon Web Services (AWS). I will share my first experiences in this blog. I will use a demo app called AmazonSwiftStarter. This app is a work in progress. I will expand it with new features, with associated blog posts. The code for this blog post (Swift2, Xcode7) is available on GitHub. Disclaimer: My goal is to share my AWS “adventures” to help others, and to learn from your feedback. AWS can be pretty overwhelming for beginners. Therefore I like to keep things as simple as possible. My most important goal is to research the features I need for my commercial app, and prototype them in this demo app. The demo app will definitely not be of production quality! In my previous post I referred to the Amazon Mobile Hub: “AWS Mobile Hub lets you easily add and configure features for your mobile apps, including user authentication, data storage, backend logic, push notifications, content delivery, and analytics.” Amazon Mobile Hub has a dashboard where you select AWS services that you want to use. After a few steps all services are configured, and objective-c client code can be downloaded. I tried it, and it works well. However, I feel the need to know exactly what’s going on, how the services are configured, and how the app interacts with the services. That is why I am starting to build a Swift app using AWS from scratch. Another (less important, but still relevant) reason is that the Mobile Hub does not (yet) generate Swift code, and it does not offer assistance in setting up DynamoDB (the AWS NoSQL database service). 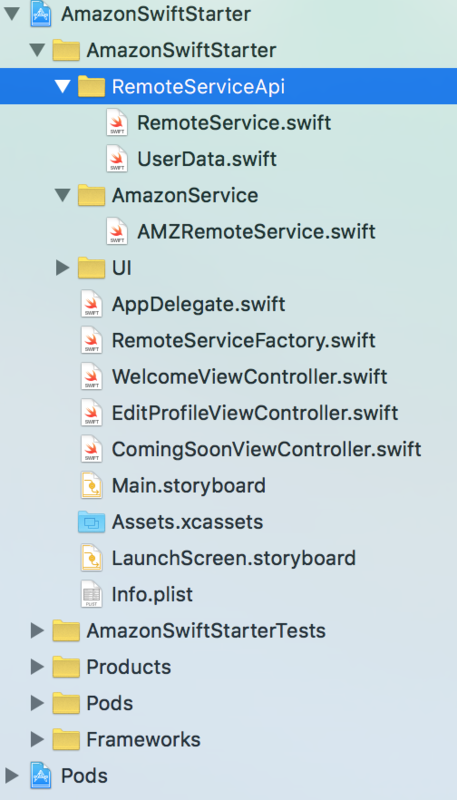 In this blog post, the first part of a series, I will describe version 1.0 of the AmazonSwiftStarter app. 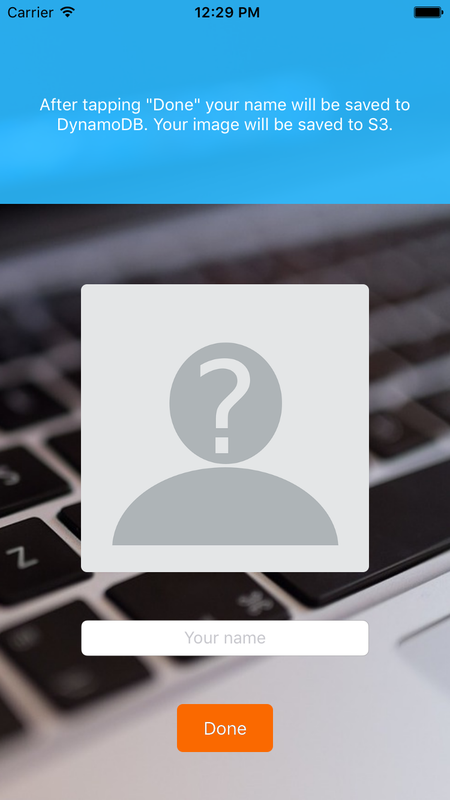 The app will let a user sign in anonymously, and let him/her create a profile. The profile consists of his/her name and a photo. Version 1.0 is prepared to access AWS, but in reality it does not yet access AWS at all. Instead it uses a simulated backend. In upcoming versions I will replace this simulated backend by a backend that does really access AWS. I will start with a few screenshots. Take a look at the blue sections on the screens for a short description of each screen. The app will use anonymous sign in with AWS Cognito. 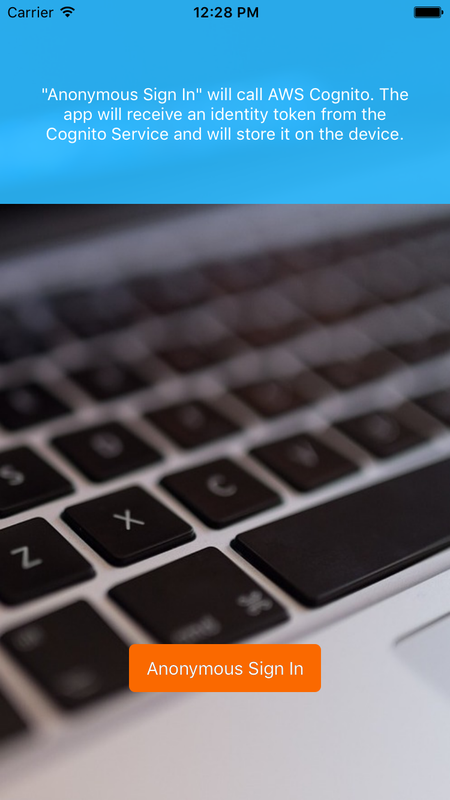 Cognito offers mobile identity management and data synchronization across devices. More about that later. Directly after sign in, an empty user profile will be prepared and stored in AWS DynamoDB. Dynamo DB is the database that the app will use to store and retrieve data. More about that later. From the user perspective their is no profile yet. He can create a profile by tapping the button. The user can edit his name and photo. When done, his name will be stored in the profile that was created in the previous step. The image will be saved in Amazon S3. Amazon S3 is typically used for storage and retrieval of images and static files. More about that later as well. After signing in and creating a profile the user will have access to other features of the app. I have not yet planned any of these features. These will be covered in future blog posts. Build and run the app in the simulator. The app should be working immediately. “Hey!”, you might wonder, “how is this possible? I didn’t setup anything yet on AWS. I didn’t even login to their console”. You are right. Like I mentioned earlier, this app uses a simple simulation of a backend service. You might have noticed that I use Cocoapods. I have committed all dependencies into the Git repository. This includes the AWS iOS SDK. Note that this SDK uses classname prefix AWS. When using 3d party services it is often a good idea to abstract from implementation aspects of the 3d party service. In the commercial app that I am developing I have applied this abstraction layer. My app “talks” to the backend via protocols. Now that Parse will shutdown I will have to replace the Parse implementation of these protocols with an AWS implementation. I do not have to adapt any other code. In the AmazonSwiftStarter I use the same approach. Let’s first take a look at the project files. private static var sharedInstance: AMZRemoteService? We have to make sure that the app only accesses the backend via the protocols. It should not directly access the implementation. To achieve this AMZRemoteService has a private init(). We use the RemoteServiceFactory to create/access the remote service (the AMZRemoteService is a Singleton). The highlighted line shows how the WelcomeViewController accesses the RemoteService without being coupled to the AMZRemoteService. Add all files with concepts that have dependencies with AWS to the AmazonService group and prefix them with AMZ. Always access the remote service via the RemoteServiceFactory. Never use a class or struct with AWS or AMZ prefix in your app logic (except in the AmazonService group). Sticking to these rules consequently will help to achieve a 100% backend abstraction. In part 2 of this series I will show how to configure the AWS services that we need for this app (Cognito, DynamoDB, S3 and IAM). In part 3 I will start replacing the simulated backend with a real one that accesses AWS using the AWS iOS SDK. Follow my Twitter to get notified about my next blogposts, or leave a reply and check “Notify me of new posts by email”. First of all I want to thank you for putting effort in writing this blog. 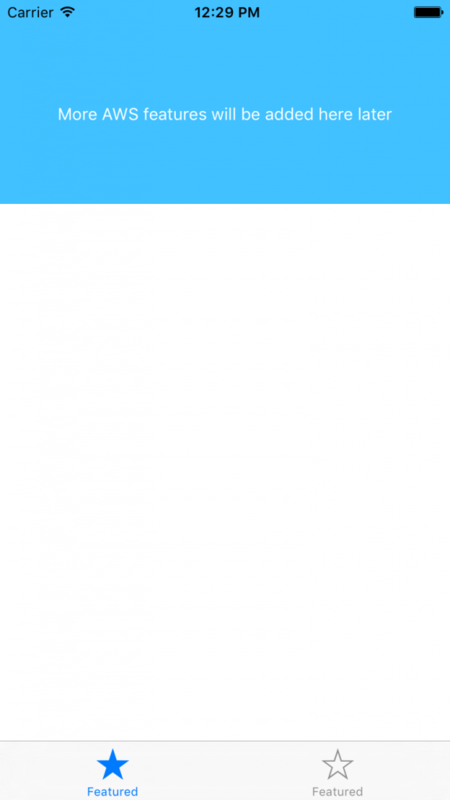 I have started to make mobile applications with Parse as a back-end. But now they announced that they’re pulling away their service. Now I’m looking into Firebase and Amazon… Tomorrow evening I have time to look at your Application and code. I think it will be very useful since I need to implement profiles, images and authentication for a certain App. So tomorrow evening I’ll let you know how it’s going. Once again, thanks a lot for your effort! Parse shutdown, the impact, and what to do next?